Each year we celebrate Twinkle Toes nameday on November 25th, the feast of St. Catherine of Alexandria. Usually I try to make a Heart Shaped Cake for the feast, but this year it was just too much. Instead we were able to pick up a super yummy (White Chocolate Raspberry) cake from a local bakery. They were more than willing to add a pink heart to the top of the cake, which served the purpose just fine. Twinkle Toes loved it! We usually give our children a small gift on their namedays. 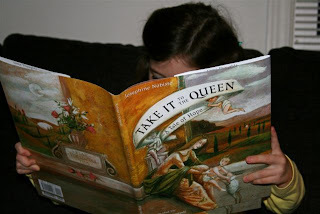 I generally use it as an excuse opportunity to add another book from my our wishlist, so this year Twinkle Toes received Take It to the Queen: A Tale of Hope . She loved it, and so did I! It is beautiful allegory of the Blessed Mother, written by Josephine Nobisso, author of one of our absolute favorites, The Weight of a Mass: A Tale of Faith . It was a simple last minute feast day/nameday celebration, but it brought smiles to all our children's faces in the midst of a very sad week, and for that I was very thankful! Question: Do you celebrate every St Catherine feast (there's a few) as a name feast?